How can you tell when it’s summer? For some, it’s the longer days filled with sunshine or the sound of children on break from school, but for me, it’s the ants. As soon as the weather warms in spring, and the moisture increases so does the ant activity. I see them in the parking lot. I see them on the sidewalk. Sometimes I even see them in my house. While most ants are harmless, I still don’t want them in my house! There are many ways an ant can enter a home, but the most alarming fact about find an ant in the house is that there is never just one. Ants live, work, and travel in large numbers. Like other household pests, ants may enter your home using gaps around doors, holes in window screens, cracks in a building’s foundation, and openings around plumbing or electrical outlets. Ants can also hitchhike into your home when you bring something inside from outdoors. 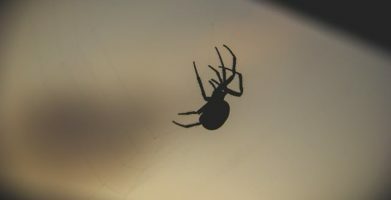 Things like a potted plant, fresh cut flowers, produce from the garden, boxes from the garage, or new items you’ve recently purchased all offer opportunities for uninvited insects to get inside your home. Broadly speaking, ants can be found on every continent around the world except Antarctica (talk about irony!). Considering there are more than 12,000 different types of ants in the world, the habitat of an ant varies greatly. Although ants can survive almost anywhere, it’s where ants live in a house that causes people the most concern. 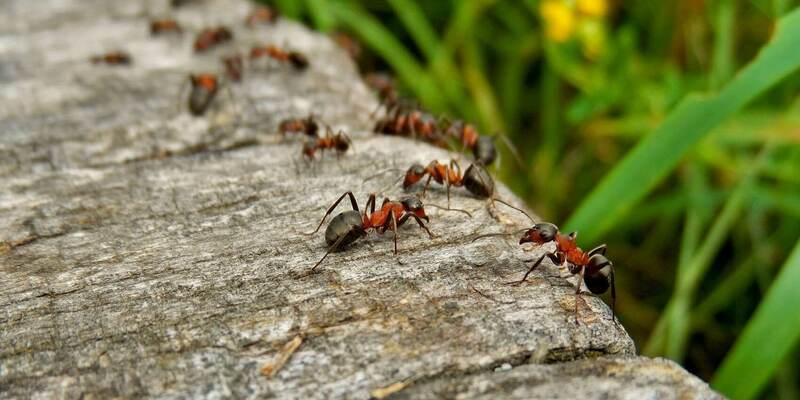 There are a few types of ants that are common household pests in the United States, but two in particular can cause problems for people: carpenter ants and fire ants. As mentioned above, most ants are harmless. However, carpenter ants can cause structural damage to trees, homes, buildings, furniture and decorative wood. Fire ants can be aggressive and will sting anyone or anything that gets in their way. While one or two stings are an itchy nuisance, multiple stings can cause a severe reaction. Like any other living creature, ants have basic needs. When thinking about where ants live, you should think about why they are there and what they are attracted to. Ants will seek places with food, water, and shelter. Many ant colonies exist outside, but the worker ants will forage for food in the surrounding areas. 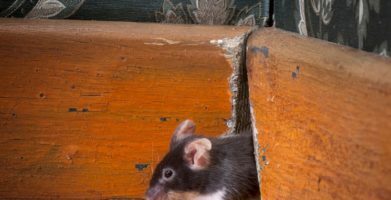 This may be why you see a trail of ants wandering across the kitchen counter, or near the bathroom sink – they will come into your home and take what they need, bringing it back to the nest for the rest of the colony. Ants live in large groups called colonies. They may nest underground, inside trees, or in the walls and voids of a house or building. Inside a home, ants can nest behind baseboards, moldings, and countertops, as well as inside walls. Each ant colony is made up of different types of ants called castes. A single colony can exist for many years with the same queen ant, but the worker ants have a shorter life expectancy. Ants eat many different kinds of food, and their preferences change depending on the time of the year. In the spring, when ants are preparing to mate and lay eggs, ants prefer a high protein diet. They may eat meat scraps left in the trash, roadkill, other insects, or fats like grease, oil, and butter. Later in the summer, when a new generation of ants requires lots of food to grow, and worker ants are busy expanding the nest and maintaining the colony’s tunnels, ants will seek carbohydrates to eat for energy. At this time, ants will be attracted to sweets such as crumbs and leftovers, spilled drinks, and garden produce. No matter how or why the ants have made it into your home, most people agree that getting them out is necessary. Why do ants come inside and what can you do about it? Many ants will survive and thrive both indoors and out, as long as there is food for them to consume. 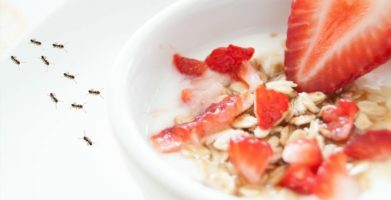 Ants do have a role to play in any ecosystem, so trying to eradicate them may not be the best choice, especially since they are relatively harmless. Ants play an important role in decomposition of organic matter, and their underground tunneling helps aerate soil, promoting healthy growth of lawns, gardens, and farm crops. All of that aside, want to get rid of ants inside your home is perfectly understandable. Click here for more information about to how get rid of ants naturally. There are a few types of ants that are common household pests in the United States, but two in particular can cause problems for people:  carpenter ants and fire ants. As mentioned above, most ants are harmless. However, carpenter ants can cause structural damage to trees, homes, buildings, furniture and decorative wood. Fire ants can be aggressive and will sting anyone or anything that gets in their way. While one or two stings are an itchy nuisance, multiple stings can cause a severe reaction. string(65) "Ant Habitat – Where Do Ants Live in Your House and in the World"